Hello hello, welcome back! 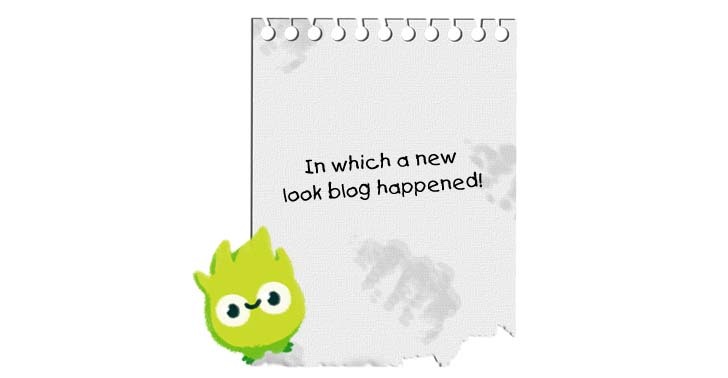 I’ve been on a short hiatus while I had a stomach bug and a cold, (ie lots of moaning), an incredibly busy children’s library (yay), but best of all, the development of my new look blog bookmonsters.info! Welcome. I started this blog two years ago, just for fun, just to share a whole bunch of brilliant books I came across in the library every day. Since then it’s grown and I’ve chatted to and befriended lots of fantastic authors, illustrators and generally wonderful book people, read a huge amount of really truly amazing books, been fortunate enough to get sent fantastic books to review from publishers, and take part in some blog tours (one of which is coming up in September, and I’m very excited about!). Since I created this blog, what feels like many moons ago, and as I have lots of new plans for the site, such as more booky posts than ever, newsletters, featured blog posts and a new writing crit service (coming soon) it seemed like it was probably due an update. Fortunately, my wonderful other half, illustrator Ste Johnson, happens to also rather like drawing and so with a professional on board, the new look is go! Ste reimagined my Book Monsters, Dimple, Deckle and Dogeared, illustrated a rather more attractive me, and with the help of my very skilled coding friend Phil Coalter, we were able to create the new look website. High fives and huge thanks all round! I wanted a cleaner, more professional look along with improved navigation, whilst still trying to retain the old Book Monster character, fun and colour from before. I just really hope you all like the new look. So now it’s all complete, I have a hugely large blogging pile to work my way down, so please bear with me while I do that. I have lots of absolutely brilliant books to share with you over the coming months. Big big thanks to everyone who has visited, shared and supported Book Monsters thus far, you are all brilliant. Please do write to me with book suggestions, website ideas, comments or complaints, I would love to hear from you. Finally, thank you for reading this new-look Book Monster blog post.